The ZYD series is specifically designed for purifying and dehydrating the used insulating oil such as transformer oil, cable oil, switch oil, etc. Also it is the best choice of filling oil into power equipment and drying moistened power equipment. 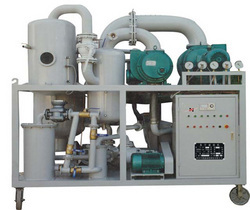 Comparing with the single-stage type, this series adopts the double-stages vacuum system, which immensely raises the machine's working vacuum degree, so it can dewater, degas and remove particulate impurities much more efficiently. It allows the transformer to be in service while impurities are effectively removed.